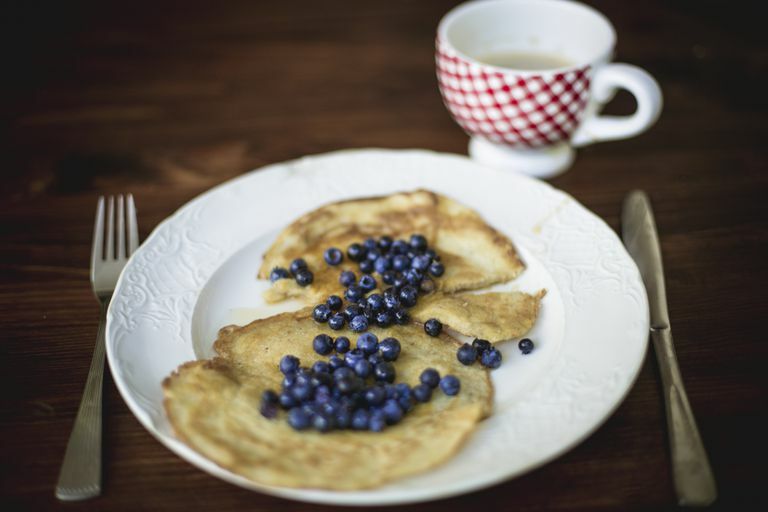 Crepe recipes may sound like they're "hands off" when it comes to cooking with diabetes but, by and large, the basic ingredients for a crepe are actually very healthy and diabetes-diet appropriate. It all comes down to how they are prepared. It is the typical high-sugar and high-fat fillings that put crepes out of sync with what's recommended for someone with diabetes. Using whole-grain flour, skim milk, and egg whites for the crepe batter can make a basic crepe even healthier. Whole-grain flour contains more vitamins, minerals, and fiber than all-purpose flour and skim milk and eggs whites are a low-calorie, fat-free protein source. It's also important to note that because crepes are made with flour and milk, they do contain carbohydrates, so even when made healthier you'll have to watch your portion. Using aromatics such onions and garlic in savory crepes add flavor and antioxidants without the fat. And seasonal fruit is economical and a naturally sweet way to lighten-up a sweet crepe filling. Combine all of the ingredients with an electric hand mixer or hand whisk to make the batter. Spray a 6-inch skillet with nonstick cooking spray. Heat the skillet, then remove from heat. Spoon 2 tablespoons batter into skillet, tilting skillet to spread the batter evenly. Return skillet to heat and brown one side of crepe. Invert pan over a paper towel to remove crepe. These can be made 24 to 48 hours ahead of time and refrigerated until needed. Cook onions and garlic in a skillet sprayed with nonfat cooking spray. Combine milk and cornstarch and add to saucepan. Cook until thick and bubbly, stirring often. Add nutmeg, cheese, and wine. Stir until cheese melts. Remove 1/3 of sauce and set aside. Combine chicken, spinach, and reserved 1/3 cup of sauce. Spread 1/2 cup of filling over the unbrowned side of each crepe. Roll and place seam side down in skillet. Drizzle remaining sauce over crepes, cover skillet, and cook over low heat until sauce begins to bubble. Whip ricotta and cottage cheese for two-to-three minutes with an electric mixer. Add remaining ingredients, except berries and crepes. Blend 30 seconds. Now, gently fold in berries. Spoon an even amount of filling into each crepe. Roll crepe around filling and serve. Is Dreamfields Pasta Everything That It Claims?